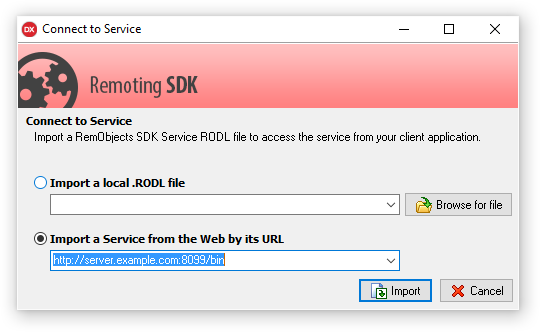 This option is available for any project, regardless of whether it uses Remoting SDK yet or not. Note: HTTP, SuperHTTP, TCP and SuperTCP server are supported via specifying http://, superhttp://, tcp:// or supertcp://. 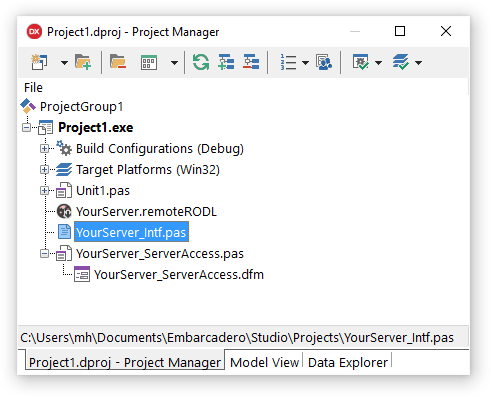 Finally, the YourServer_ServerAccess source file and matching .DFM contains a small helper class (based on a Data Module ) that provides a convenient starting point for encapsulating the access to your server from within your client app, alongside all the non-visual components needed for that. Once created, this file becomes "yours", and you will most likely expand it to expose functionality more specific to your concrete server. The ServerAccess class is merely a suggestion and an assistance to get you started, you can feel free to simply remove the file from your project, if you want to structure your server access differently within the client app. Let's have a closer look at what's inside the ServerAccess class. It's singleton class with a single instance, accessible via the static instance property. It encapsulates your server URL and the Remoting SDK components needed for the communication, such as the Client Channel and Message instances, and it exposes public instances of your service proxies. Of course it is up to you to decide which aspects of this fit your application's design, and which need changing. For example, you might not want to expose all service proxies publicly, but instead encapsulate access to certain services with bespoke wrapper methods you add to ServerAccess yourself.